I just wanted to thank all the staff at Northenden Golf Club for hosting our training day. You were very easy to deal with to make the arrangements for our event, the facilities are second to none and your catering staff were so responsive to the requirements of our participants that they all went away saying what a great venue it is. And the view..... If all training rooms had a view like that, I would run events every day. We will be back and I will be passing your details to other contacts in the Manchester area.. Please accept our very many thanks on behalf of myself, my family and our friends: The reception for my Dad’s funeral on Saturday was perfectly fitting and managed both professionally and tactfully under the circumstances by your superb staff. The function suite was ideal - we loved the modern room, balcony, views and discrete Christmas decorations. The environment certainly helped engender the warm and welcoming atmosphere felt by all. The staff were helpful, friendly but very appropriately understated which we appreciated. The food was spot on - the right amount and delicious. My Dad was a marketing manager for the Coop chilled foods department and pies were one of his many products - his colleagues assured me that my Dad would have been quite delighted with the steak and ale pie and believe me, that is quite an accolade! Thank you too for your time and patience in helping us to organise such a fitting reception at such short notice and under these circumstances. Good morning Northenden Golf Club. Just to say we had a lovely time yesterday - things have really improved with your brand new clubhouse since our first visit years ago. Great Christmas decorations and excellent service and food. Please thank your staff again for me. What a great night at Northenden Golf Club celebrating my 70th and my daughter's 40th birthdays. The room was perfect for our needs and the hot buffet was excellent.We would both like to thank all the team for helping make the evening so memorable. I would like to thank all those involved in arranging my mother’s wake. All our guests were impressed with the surroundings.They were even more impressed with the hot buffet of Lancashire hotpot and the steak and ale pie; everyone left fully satisfied and everyone commented how good the food was!! Thank you again to all your staff who saw to all our needs and made us very welcome it was much appreciated. Just wanted to say a big thank-you to you and all the staff for making my 50th a great event. Everybody enjoyed it immensely. The venue is lovely and the staff were really helpful, friendly and welcoming. Please pass on my heartfelt thanks to all the staff who contributed. We recently spent an afternoon at Northenden Golf Club after a family bereavement. All the NGC team were a pleasure to deal with. The club was recently rebuilt and is a very attractive and high quality venue. 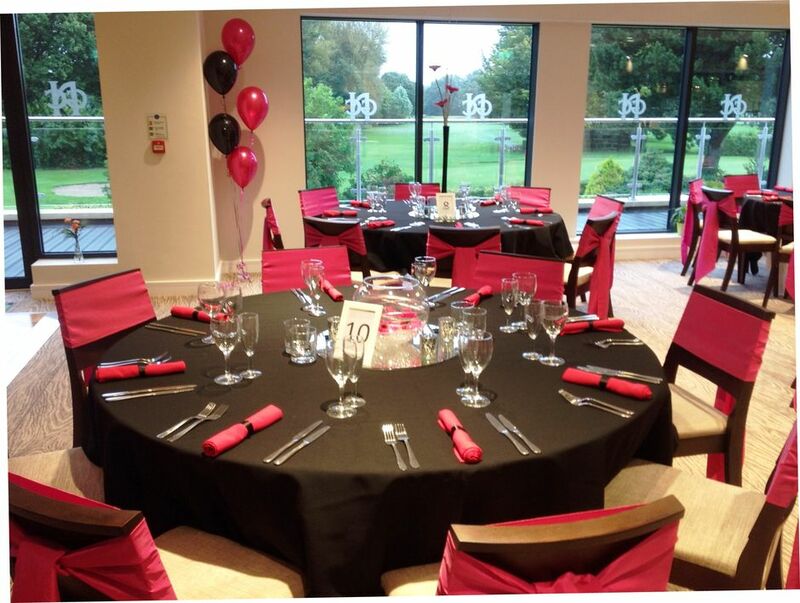 The function room is superb with views over the golf course along the whole of one side of the room through glass doors which allow access to a balcony outside – all our guests commented on how impressive it was. The hot meals served were fantastic and all the staff were very courteous mindful of the nature of the function, but also friendly and happy to assist. Earlier this month North Cheshire Serra Club held our Annual Charter Night Dinner at your Golf Club. All your staff were most helpful with the arrangements and the meal was excellent. Everybody enjoyed the evening. Just to report that our training day at NGC was again a great success. The students very happy with venue, food and staff. Had a great day today . We had a 20 turnout, the breakfast was top and your staff really looked after us. The weather held up which was lucky, and the course was in good nick for this time of year. I will be booking for next year June or July - will confirm January at the latest. I think we will have a better turn out next time, probably 24 plus. Many thanks to all at Northenden. Our 12th consecutive year and always considered a highlight of the Calendar. proved to be as good as usual. The warm welcome by the Society organiser the wonderful course and the great and plentiful food after guaranteed we booked for next year on the spot. A big thank you to all at Northenden GC for making our visit such a memorable one. The course was in great condition and the food and general hospitality first class. We were met and greeted and made most welcome and the visit went without a hitch. In all it proved to be an an excellent experience from all at Woolton GC, Liverpool and one to be repeated next year. Nice to see you all again yesterday. Many thanks for the warm welcome with the message on your TV screen in reception. Once again I cannot praise you and your staff enough for the excellent service in the clubhouse and superb condition of the golf course. All comments from the lads were complimentary and positive. No doubt we will be back for another visit (we`d be foolish not to) and it was mentioned that Northenden should be a regular event in our calendar. On behalf of the Rotary Club and the three charities - Help for Heroes, Prostate Cancer and Rotary - a huge thank you to Northenden Golf Club. Special thanks also to all those golfers who braved monsoon conditions on what must have been the worst day of the year to play Golf, and we are not forgetting Steve and Phil who stood out in the rain to start everybody off. An event this size needs planning and organising and we are indebted to Terry Tivenan for all her hard work in the lead up to the day, on behalf of the Golf Club, to make the day possible and the Rotary Club appreciate her help. On the day, Gay James, Joan Birchall and Bridget Hopkins from the Ladies Section made the day run smoothly alongside Roy Moore who juggled with cards and such arcane procedures, as keeping score, to finally give us the winners. It was a pleasure to sit back and watch, in the dry. The Rotary Club also thank all those who donated to the raffle and who made individual donations to the charities. We don’t yet have a final figure, no doubt Lady Captain Kate, who is also a member of Rotary, will keep you all informed. Once again, a big thank you to all at Northenden Golf Club for hosting and magnificently supporting this event, and before we forget, the steak pie at the end of the day was superb. The members of the Association have asked me to write to pass on our gratitude to all at NGC for our day with you on 17 September. As Chairman Steve said he chose NGC as he trusted you to provide a first-class venue for our annual Chairman’s Day, and certainly he was wise in his choice. Many noted how good the food was and with Will and Carolyn in the kitchen we have always experienced consistently high-quality catering on our annual visits. Paul and the bar team provided a smooth and effective bar service throughout the day which was always appreciated. NGC has bounced back from the tragic fire and we hope that in the near future a representative of the club may look to join our Association. Thank you again John and we look forward to returning to NGC in the 2019 season. Thank you to everyone for all your help with organising our party. We had a lovely evening. Please extend our thanks to all the staff who helped that evening. The buffet was hugely appreciated by all our guests. I wish to take this opportunity to thank you on behalf of my wife and family for all your help with the preparations for our wedding. From the very beginning you were on hand answering all our questions, and offering your experience with anything we were unsure of - even being present until the evening of our big day to make sure all ran smoothly. The room looked amazing and the outlook over the golf course is fantastic. Our guests commented on how good all three courses of the meal were - as well as the evening buffet. All your staff were friendly and willing to assist in any way they could. The day could not have gone any better, and I would recommend Northenden Golf Club to anybody looking for a wedding venue. Just a quick note to say thank you for Sunday. We had a great day and everybody really enjoyed the reception at Northenden. The food and service were excellent. It’s also a really good space with lots of light on a dreary day! I’m sure we will use the space again in the future. Many thanks once again for a very enjoyable day. The course and clubhouse facilities are a credit to all concerned. With plenty of preparing to do to make sure the golf day runs as smoothly as possible, I found the cooperation from the golf club to be exceptional. All the NGC team helped with planning the best location for the sponsors' banners so they got the best exposure and they also contributed with competition ideas. The hospitality and catering staff exceeded expectations. Thank you to all the team and the golf club - we look forward to holding our event with you again next year. All the Dudson members were very complimentary following our visit. The course was obviously affected by the recent drought as all courses have been, but they commented on the quality of the greens. The breakfast was excellent and the welcome and attention from all the staff was lovely. We recently held our company summer party at the golf club. John was really helpful with the planning of the event from the initial enquiry through to the actual event. The room is a brilliant, bright, versatile space and with great views of the beautiful golf course. Our event ran smoothly and the food was delicious. The team on the night were really helpful and accommodating. All our staff commented on what a great evening it was. We would highly recommend this venue for lots of events. Everything went very well, thank you. Having spoken with my colleague Anita and the other delegates, their feedback regarding your location: clubhouse; room; views; facilities; services and food was an overwhelming “fantastic”. Intersolia will be very happy to recommend NGC to others who may be considering holding an event in your area. Thank you for your hospitality during our recent visit. The catering and the staff were excellent and a credit to your club. The course was in great condition considering the recent heatwave we've been having. I run the North West Amateur Seniors Tour and Northenden Golf Club have been kind enough to host us on five occasions. Every time we play, everyone comments on how great the course is and in superb condition. One said this time that the greens were the best we have played on this season. The staff are lovely and can't do enough to help with all your requirements. The clubhouse is fantastic as is the catering. A great day to be had by all - keep it up !! Just wanted to say a big thank you to you and the golf club for sorting out my wife’s birthday party. All of your staff were really attentive and many guests commented that the buffet was of exceptional quality. We were very lucky with the weather and it was great to be able to sit out on the balcony enjoying the spectacular views over the golf course. A fantastic time was had by all and we would not hesitate to return to the club for similar events in the future. From the moment I picked up the phone to discuss the booking the club could not have been more helpful. Lisa in the office was more than helpful and when we spoke I could see you had it all in hand. On the day your introduction to the society was very helpful and well received - plus your help in sorting out holes for prizes was most appreciated. The course was in superb condition and last but not least the catering was superb and your colleagues could not have been more helpful both for breakfast and lunch. Many thanks to you and all at Northenden. We had another fantastic day and evening at NGC last Friday. The meal was the best yet - so big thanks to Will and Carolyn. On behalf of the family, I would like to thank you and the team at Northenden Golf Club for looking after us so well yesterday. Everything went according to plan. The food was delicious and the staff were so helpful. It is such a wonderful venue - however it is the people that help to make any event go well. We sincerely thank you for looking after us so well. We had a fantastic night and everybody said how amazing the room and food were. I would like to say that Will on the bar was fantastic and worked so hard - he really was amazing!!!! We will pop him some chocolates in to show our appreciation. We held our annual golf day at Northenden Golf Club this year, and from the outset in respect of the ease of enquiry to the booking, the professionalism and helpfulness were evident. The rate given to us was affordable and good value for money. On the day, the standard of the facilities was second to none. The function room was laid out perfectly. Table cloths were being ironed as we arrived, bowls of rhododendrons from the course added a huge amount of colour to the tables, a lovely touch. The course was in great shape and played beautifully. The food and drink service was excellent, everything freshly cooked, plentiful and served by Will, Carolyn and their colleagues. Roy on the registration desk was incredibly helpful and knowledgeable. Nothing was too much trouble for the whole team, and special thanks go to John and Lisa. We will definitely return. Thank you for letting the Fox Golf Society play at Northenden Golf Club. On arrival our reception was exceptional, very friendly and informative. All your members were friendly as well and went out of their way to say hello or make a comment on how well dressed some of our members were. The golf course is in very good condition with some testing holes. After the golf we all ate the steak and ale pie, chips and peas. Every one of us enjoyed it - and the fantastic service. All in all our visit was perfect. As a society we would recommend your golf club to anyone. Thank you to Northenden Golf Club for being the perfect venue for my sister Karen's funeral wake on 8th May 2018. The staff were professional and courteous and the food delicious and quality. At such a sensitive time I felt that we were really in good hands. 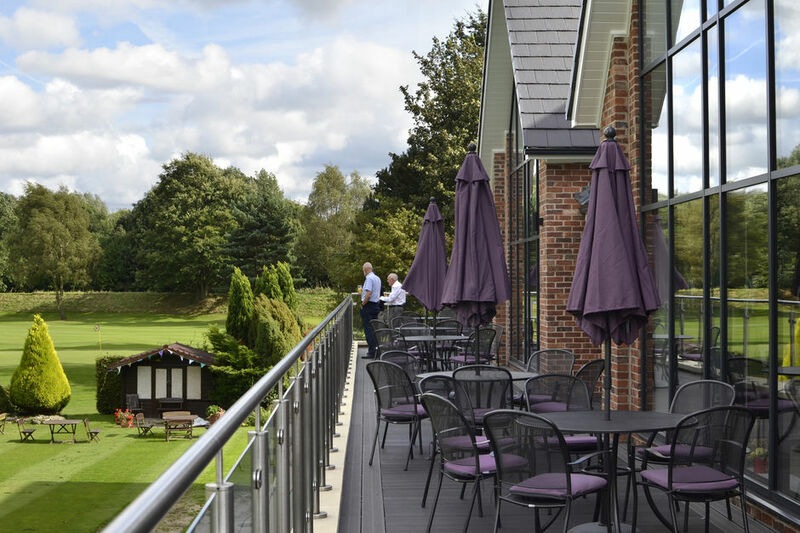 We were very fortunate in having a lovely sunny day and able to make full use of the wonderful patio area overlooking the course. Thanks again, I would recommend without hesitation. For the second year running, St Joseph's School PTA held our Spring Dance at Northenden Golf Club and again the night was a wonderful success. The room itself is stunning, with a bright, modern interior and, of course, amazing views over the golf course. John and Carolyn were both an enormous help in the planning of our event and on the night itself did an amazing job, with their team, to put on a very enjoyable, successful evening. The room looked amazing, the quality of the food and service were commented on by many of the guests and everything went very smoothly. We hope to return to Northenden Golf Club again in the future and would highly recommend it as a venue for any event. I just wanted to say a massive thank-you to you and your team for making Sunday such a lovely occasion. It is a fabulous function room with a beautiful view. If we ever need a function room again we will be back. Can you please thank everybody involved in making Friday such a fantastic day. The food from Carolyn and Will was excellent and we received many compliments from the diners. The service in the bar was superb from Paul and his team - and the course played really well considering the terrible weather we have had. Thank you so much for all your help in setting up my birthday party. The food was wonderful and everyone was very complimentary - the steak pie in particular was a big winner! Thank you to the Chef and all the kitchen and bar staff who were all brilliant throughout the night. All of my guests commented on how lovely the golf club is for a party and I was incredibly proud to show off NGC to my friends and family. Many thanks once again and I’ll no doubt see you on the course soon! All went well on Wednesday. Great venue and the food was excellent. Many thanks. Just a quick note to say we had a fabulous time at NGC on Sunday for my 50th birthday party. The staff were amazing. I just wanted to say a big thank you to you and your staff for hosting our breakfast meeting on Friday. We were really happy with the morning - and the food and facilities were perfect for our needs. Thanks to you and the team for providing such a fantastic venue and catering for our son's party last Sunday. Everyone had a great time - the food was just right and it all came together well. And most importantly the birthday boy loved it!! We can't thank everyone enough at Northenden Golf Club for helping us arrange my dad's surprise 50th birthday party. You ensured that what could have been a stressful time was carried out with ease, right down to visiting the venue, ordering of the food, including gluten free options, and to the delivery of the event on the night. The venue was perfect for this event, the food was delicious and the staff were extremely welcoming and accommodating. I can definitely recommend this venue to future customers who are looking for a stylish, clean and welcoming venue. Thank you again for all you did and we look forward to hopefully booking with you again in the future. Thanks for all you did for us on Sunday. Breakfast was great and really set us up for the day. The course was great considering all the wet weather we have had recently. Very surprised how fast the greens were - top marks to your green staff. And I must say you have a very warm and welcoming clubhouse, staff and members. Thanks again - hope to see you in the summer when we can play the course it at its very best. It was a real pleasure to see you at the meeting on Thursday - please feel free to join us any time, we are here every week. Could I take this opportunity to thank you and all the staff at the golf club for your contributions in helping to make not only this very important meeting a great success but every week. We are sometimes unclear on attendees until very late, usually about 50, but the staff always accommodate us with a smile and great attitude. The group has grown considerably lately and we believe your venue and staff have played their part in that. Great evening in a wonderful setting. The delicious food was beautifully complemented by the smooth sounds of the Suzanne Mott Jazz Quartet. A great evening all round. After the Society's AGM and annual dinner at NGC, the President was so impressed with the catering and service provided that he insisted that all the catering staff should appear before the members for a rousing ovation. Praise indeed. Many thanks for making such a difficult day pass without a hitch. I can't fault anything. Lovely setting, fabulous buffet that never ran short. A special thank you to Carolyn, who made sure that nothing was a problem, no matter what we asked. Made really welcome. Highly recommended - perfect. 5 stars all round. Thank you for your help with the reception arrangements for my mum's funeral the other day. Carolyn was fantastic on the catering and I received many compliments from guests about the venue, how friendly the staff were, and that the food was first class. Thank you so much for all your help in organising our Christmas party. It was a great success and everyone thoroughly enjoyed themselves. The room looked so lovely, beautifully decorated, and the food was delicious.The staff were amazing and so helpful and kind - nothing was too much trouble for them. Please thank all your lovely staff for looking after us so well. We will definitely be booking again soon. Have a lovely Christmas and Happy New Year. Northenden Golf Club was a great venue for our Christmas party. Easy to organise and everything met our expectations. Would definitely recommend. I write to sincerely thank you for hosting my father's funeral reception yesterday. The room was perfect, and the views sublime on such a beautiful day. Everyone enjoyed the delicious food and the extensive choices were appreciated, especially the scones. The bar service was exemplary. We have received so many compliments from our guests for the choice of venue. Very well done - you did a fantastic job at a very fair price. When you organise a golf event for early November you are always slightly concerned - but no such worries at Northenden Golf Club, where the USGA greens were firm and rolled beautifully. We were welcomed by staff and have to say the Xmas menu we ordered was superb. I have no hesitation in recommending this as a quality golfing venue. The team thoroughly enjoyed it on Friday and I think the hospitality and venue made the day perfect. The friendly accommodating catering staff were second to none and are an asset to you. It went down a storm - a definite winner. I couldn’t have asked for a better venue for my 40th Birthday Party. All my guests commented on how lovely the venue was, as well as the food and staff. I wouldn’t hesitate to use it for my next big bash! Can you be so kind as to pass on my sincere thanks to John , Carolyn and staff. We were looked after very well on the occasion of my mother’s funeral yesterday. All went smoothly, and the food and service provided were excellent. The young man and lady who served us were very polite and understanding. I praise and recommend you all. We had a wonderful and energetic time. All our guests have made several positive comments about both the night and the venue. Complinents to your chef/catering staff who did very well in providing all relevant meals. Best wishes and see you again soon. Thank you so much to everyone at the golf club. Mum and dad thoroughly enjoyed their joint 80th birthday party. The day went very well. The students were very happy with the facilities, the food and the helpful staff. Just wanted to thank you for letting us host Emily's party at the Golf club on Sunday. Such a wonderful day and a perfect venue. Please will you pass on our thanks to all of the staff who were so helpful. We had an excellent day on Sunday and would like to thank yourself and the rest of the team at Northenden for making the day a great success. The course was a credit to everyone involved, accepting that recent heavy rains were always going to make conditions underfoot not ideal. That said the greens were as good as any I have played on all year - and I have played many of the best courses in Yorkshire and Cheshire. Our experience from the initial reservation through to reception on arrival, dining and bar was 10 out of 10. Many thanks to the staff at Northenden for making our all NTC away day such a great experience. The facilities are wonderful, the food was great, and we all appreciated the service we received. We recently had our daughter's naming ceremony at NGC and we would recommend it to anyone. The room, food and staff were all excellent. We will definitely be having our next event at the club. Special mention to John and Paul who made everything run so smoothly. Fantastic venue for my 50th birthday party, the location is great, just the right size, nice and modern and it was great to open up the glass doors on the balcony. Catering was superb, everyone enjoyed the food and friendly bar staff. Overall the venue is first class, well organised, great help from John and the team for catering arrangements, with great suggestions for menus. I can’t recommend it highly enough. A pleasure to organise and fantastic to hold an event. I am writing to extend a massive thank you to all the staff at Northenden Golf Club who worked so hard to make my birthday party a night to remember. Special thanks to Carolyn, Andrea, Will and all the staff behind the scenes. The steak and ale pie was to die for and everyone complimented on the food including my gluten free friends who thoroughly enjoyed the chicken and mushroom pie! Your attention to detail and help with all my queries was much appreciated. All the guests were really impressed with the venue. Thanks again to you all. Just wanted to drop you a quick line to say Thank You very much for all your help at my Picnic last Friday. The whole day was fantastic and I have the backing of 35 other persons to confirm that. They all had a great time. Please also pass on my thanks to all the kitchen and bar staff who were so helpful and professional throughout the day. Your club can be very proud of its staff. I recently enjoyed my 50th birthday party in the function room at Northenden Golf Club and the whole night was superb. It is a fabulous venue, particularly on a nice night when you can make use of the balcony. All my guests were so impressed with the room, food and service. John and Carolyn made it all run smoothly for me from booking it right through to a fantastic night. Yes it was an amazing night thank you, I think we’ve ended up raising over 28k!!! Thanks for all your help and especially thanks Carolyn and Paul they were super stars. Hopefully see you on the course soon! A massive thank-you to you and all staff who made our wedding day so special. Thank you very much for all your effort - really appreciated. We will never forget your help.